12 Chemical Reaction Stations demonstrating IC, CC, DR, SR, D and S reactions! 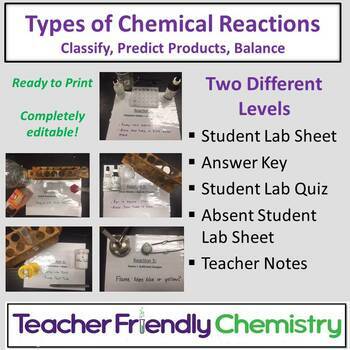 There are 2 forms of this lab for differentiation for struggling students in Regular or to use for students in Integrated Chemistry Physics. Regular Form: Students predict products and balance equation. ICP Form: Students balance given unbalanced equation.